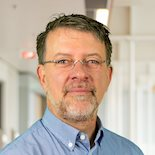 Paul Span is vice-chair of the Radboud (RUCO) Breast Group, responsible for basic and translational science, and Basic Affairs Officer and member of the Steering Committee of the PathoBiology Group of the EORTC. He is PI of the BBMRI sponsored Nijmegen breast cancer biobank, and involved in the recently initiated Radboud Biobank Breastcancer. He has over 170 peer reviewed papers (h-factor 33), mostly on breast cancer, and has been thesis advisor in 7 PhD studies. The work of Paul Span as Head of the Radiosensitivity Group at the Department of Radiation Oncology of the Radboud university medical center is focused on the prognostic and predictive consequences of molecular biological aspects of tumor cells and tissue in their relation to the microenvironment. A major research focus is on the role of autophagy in treatment resistance. Recently, a clinical trial on the effect of autophagy inhibition using hydrochloroquine (Plaquenil) on the tumor microenvironment has been concluded in breast cancer patients (clinicaltrials.gov identifier NCT01292408). Further, he is involved in the triple negative and hormone receptor positive breast cancer initiatives within the International Cancer Genome Consortium (ICGC), which has the goal to obtain a comprehensive description of genomic, transcriptomic and epigenomic changes in 50 different tumor types and/or subtypes.